Mort Kunstler Handsigned & Numbered Limited Edition Giclee on Canvas:"Tender is the Heart"
Size: Image Size: 14" x 18"
About the Art: Amid the wages of war, it was a celebration of life. On May 1, 1864, a high-ranking group of Confederate officers gathered at the Mayhurst located in Orange, Virginia. Chief among them was General Robert E. Lee, commander of the Confederate Army of Northern Virginia, and one of his three corps commanders, General Ambrose Powell Hill. The purpose of the meeting was not wartime strategy: Instead, Lee and his lieutenants were assembled for the baptism of an infant. The child's name was Lucy Lee Hill. She was the daughter of General Hill and his wife, Kitty. They had named her in honor of General Lee, who had agreed to be the child's godfather and joined the parents at her baptism. Lee's participation reflected a key character trait: humility. Although faced with a multitude of duties as army commander, Lee took time to participate in a child's baptism. The Reverend Richard Davis of St. Thomas Episcopal Church in Orange conducted the ceremony, dedicating tiny Lucy Lee to the Lord's service as he baptized her with water from a silver bowl -- in the name of "the Father and the Son and the Holy Spirit." What could I paint to commemorate the 200th anniversary of General Robert E. Lee's birth? That's the question I asked myself as I thought ahead to January 19, 2007. What could be the subject? I decided it had to focus on Lee, the man - but what event? Then, as I returned to Dr. James I. Robertson, Jr.'s wonderful biography of A.P. Hill, I discovered a possible subject. I double-checked R.E. Lee by Doublas Southall Freeman and was convinced that I had found the ideal situation. What emerged was the idea of Tender is the Heart. "On May 1, a clear and warm Sunday," wrote Dr. Robertson, "the Reverend Richard Davis of St. Thomas Episcopal Church baptized Lucy Hill in a ceremony at Mayhurst. 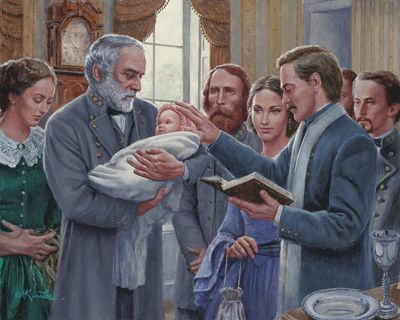 General Lee was godfather and held the infant in his arms throughout most of the service." What an appropriate scene to observe the 200th anniversary of Lee's birth! It would depict Lee the commander in uniform with some of his officers - and, most importantly for my purposes, it would show the humility of Robert E. Lee the man in a tender, poignant moment reflective of his character and personality. Imagine General Robert E. Lee holding a baby - General A.P. Hill's baby - which to my knowledge had never been painted! The Mayhurst, where the baptism occurred, is now an inn - a picturesque bed and breakfast in Orange, Virginia. Frank Walker, a knowledgeable local historian in Orange, helped with research about the event. Jack and Pat North, owners of today's Mayhurst Inn, described the room in which the ceremony probably took place - and even obtained photographs of the silver bowl and goblet used in the ceremony. (The artifacts are in the collection of St. Thomas Episcopal Church in Orange.) It's all too easy to think of the Civil War in terms of huge battles and marching armies. But, as with all history, it's actually the story of real people caught by passing events in a real time and place. The challenge for an artist like me is to capture the meaningful human moments that best represent the people and the events of the era. I hope Tender is the Heart is a reminder of the "other" side of the Civil War -- and especially represents the heart of one of the era's greatest figures: General Robert E. Lee.